The invention of the modern hearing aid was a pretty big step in comparison to the days of using an ear trumpet to aid in hearing loss. However you may be surprised to learn just how much hearing aids have changed in the last 5 years alone. At Beltone, we’re not satisfied with just your basic hearing aid. We want to bring you the best listening experience possible, which means we are constantly striving to improve on our technology and the features of our hearing aids. As some people are new to the “hearing aid lingo” we wanted to introduce you to the unique features available now in our digital instruments that help make the “Beltone Difference”. Feedback Eraser- Say goodbye to annoying whistling and buzzing that may have been a complaint of hearing aids in the past. The Feedback Eraser w/ Whistlestop makes sure your hearing aids wont buzz or whistle whether you’re on the phone or hugging a loved one this eliminates the unwanted noise so you can hear what matters. Auto-Phone- A feature that automatically turns on a dedicated telephone program when you bring the phone to your ear. When placing the phone on one ear this automatically reduces the room noise coming into your non-phone ear. It’s so easy to hear your phone call & there’s no need to manually change programs. Tinnitus Breaker Pro- Tinnitus, or ringing in the ears, is annoying for anyone who experiences it. The Tinnitus Breaker Pro option available on some of our models generates white noise, making tinnitus less noticeable. Your Beltone Hearing Care Professional can tell you if this type of instrument is right for you. Wind Noise Reduction– Beltone Promise uses advanced technology to reduce wind noise and ensure effortless listening outdoors—even when you’re on the phone. AFX Music Mode- This new setting on some of our hearing instruments will process music without producing any other internal sounds. Speech Spotter Pro & Spatial Directionality- These two technologies allow you to easily understand & hear speech clearly in noise. They identify and focus on the individual speaking to you while eliminating background noise for easier listening. When speech isn’t detected it allows you to focus on the environment around you creating a natural listening experience. Sound Cleaner Pro & Smart Gain Pro- Designed to address hearing in multiple listening environments, they intelligently adjust amplification, and noise reduction settings to make for a seamless transition between environments. They make voices sound natural, and you remain in touch with your surroundings because background sounds stay audible, without being distracting. Cross Link Directionality- Our brains choose what to listen to and what to suppress in noisy environments, The Cross Link Directionality feature uses this same technique to help you hear clear speech, while keeping you aware of sounds that are important. It works by allowing each hearing aid to analyze your surroundings, and then share information with the other. 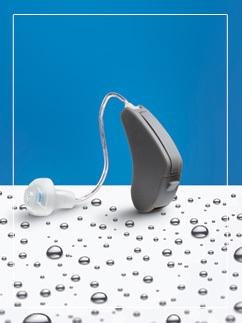 The hearing aids work together to automatically adjust their settings for the best results. They let you easily focus on the speech you want to hear without losing the ambient sounds that enrich your experience. Water Protection- HPF80 NanoBlock™ protection is a coating that’s applied to every hearing aid component, inside and out. NanoBlock protects delicate electronics from substances that can cause damage, such as moisture, dirt and ear wax. You avoid repairs, and spend more time loving what you hear. Wireless Technology- Beltone was the first hearing aid company to offer an entire line of 2.4 GHz wireless accessories that works without cords or neck-loops. Our exclusive 2.4 GHz technology sends clear sound from your TV, stereo, PC, phone, iPod® and more, directly into your hearing aids. You can also use the Beltone myPAL to stream someone’s voice, or your music, directly to your hearing aids—at home, or on the go. To learn more about our wireless accessories click here.